I really enjoyed this book too, as well as the reading I saw her do in LA. She's so damn smart and opinionated. I think I may have enjoyed Bel Canto more, but, nonetheless, this is still an awesome book. Smart and opinionated, yes - but never stand-offish (at least in the few times I've now "seen" her on the web her since The Colbert Report appearance). She's awesome. Just ordered Bel Canto - can't wait! Best part of that Colbert interview? The end when Colbert recognized she should have the last word. To repeat one small counterpoint from the comments on Colbert, though, I must remind your readers that smart people and book signings/author vists and story time all take place at the library, too. Amazon can't kill community. Thanks - that's a great reminder! This was one of my favorite books from last year. I agree, she writes wonderfully. I need a little time yet before I also put it in "favorite of the year" category - but it stands a good chance! Wow this sounds amazing! I am reading this one in the next month but I'll be reading it with great excitement now! Enjoy it - it's definitely one to look forward to! I'm so excited to hear that you liked this so much. I've heard so many mixed things, but I also thought The Getaway Car was soooo good. I'm going to be in Nashville next week, so thanks for reminding that her indie bookstore is there. Ha! ...one of my favorite words! I still don't get the mixed reviews - seems like a lot of the issues people had with it would disappear if they put a little more thought into it. But sometimes, there's just no accounting for taste. I was firmly in the "did not love it" camp. While I think Patchett's writing is first-rate, I was hoping that she would have tackled the ethical issues associated with developing a drug that allows women to give birth so late in life. I did want to take Easter home with me though. The ethical issues were certainly part of the subtext of the modern vs. primitive theme, I think. Dr. Swenson even mentions several times, too, that the human body isn't made to have kids that late in life. Finally, there's the interplay between the malaria drug and the fertility drug - saving 800,000 lives a year plus at least that many more children with the fertility drug = ethically questionable from an overpopulation and resource management standpoint. Great review! 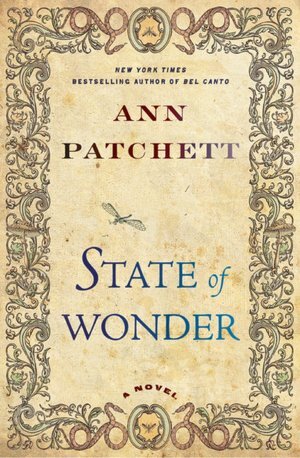 I loved it and gave State of Wonder five stars, too. I really want to read The Getaway Car. I don't have an ereader but might buy it as an ebook anyway, as it doesn't seem to be coming out in print anytime soon. You can download the Nook or Kindle apps for your computer and read it that way (you don't actually need an ereader) - I read a couple Kindle Singles and B&N short pieces that way before I got my Nook. It's a good way to go - and you should not hesitate to read The Getaway Car. It's really friggin' good! It's not even half as good as Bel Canto. "The quiet that was left without her was layered, subtle: at first Marina heard it only as silence, the absence of human voices, but once her ear had settled into it the other sounds began to rise, the deeply forested chirping, the caw that came from the tops of the trees, the chattering of lower primates, the incessant sawing of insect life. It was not unlike the overture of the opera in which the well-trained listener could draw forth the piccolos, the soft French horn, a single meaningful viola." "State of Wonder" was a moving, emotional, heart wrenching and awe inspiring story. 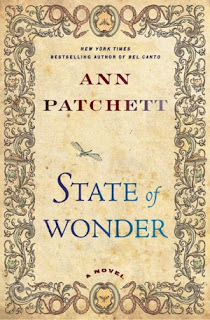 I think I even turned the pages more slowly as I tried to absorb the words and the images of the Amazon jungle that Patchett brings forth in this wonderful novel.